RF Roller Chain for direct conveyance in Lambda specifications. Enables lube-free conveyance. 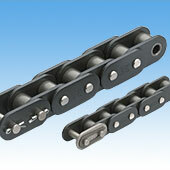 This roller chain has oval plates, making it perfect for directly conveying goods on the chain.